I Have received a few of those release and I have to say I’ve been impressed and enjoying the content coming out. Now I Do have a Gripe or two but on the most part I Like what I’m seeing and I’m looking forward to seeing what will come out Next. Now I’m writing this article as I have now laid out my thought to each release I have received yet, so I’m going to do that here. Each release has a release Number so the first release was 1 and so on and I see collectors needing to have them all so you’re not missing a number. I have releases 3-6 and didn’t opt to receive the first 3 releases and now I’m kind of disappointed in myself. Lets get into what has been released so far. From the releases so far that has been shipped to me, each release has a bunch of extras and cool artwork that gives an Old VHS Tape vibe on each slip cover. Black Eagle is the first to hit my hands and its the one that lets me down. Now the release didn’t disappoint me from what was to release next as I had reassurance that the first two releases didn’t have this issue. Now the issue for this release was the Picture Quality. Now I have no clue how it looks when it was first released on VHS or DVD and or if it had this effect but with this Blu-Ray release the Picture has an Oil Painting look to it so it kind of makes it look weird. Getting past this the movie itself I went in thinking its a Van Dam movie but its a Sho Kosugi film. Van Dam plays the bad guy and it was an OK role for him. Action was fun and with these types of film with Sho, he has a thick accent and he speak English. I don’t mind as I do love a lot of his films. The film is Cheesy at times and wished the action was a bit more. Overall the film was good watch minus the oil painting look. 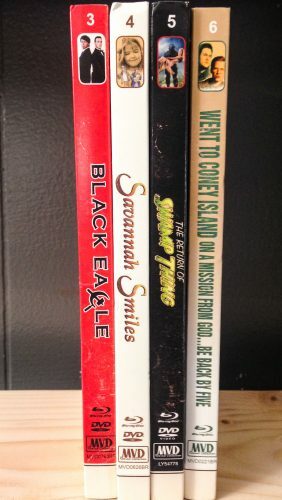 Savannah Smiles was the next in the collection and for me its a film I have never seen and that will be with most of the releases and future release which I do like. This film is about a little girl running away from home and attached her self with two thieves, one who just escaped prison. They get caught up now with everyone thinking the kidnapped her but in reality the two fell in love with her and she makes them want to change their ways. Overall the film was a fun watch and it can lead to a tear or two. I Enjoy this one a good bit and the Picture Quality looks great. The Return of Swamp Thing is the next blu but its last of movie in the bunch I have watched and its fresh on my mind. First thing would be, it looks pretty good on Blu-Ray with good sharpness and colors. The film its self is pretty cheesy but I Like it. It’s a weird comic book hero and of course this is a sequel to the first. The film may not be for most but for those who love these types of films will love it an d the first thing that came to my mid while watching this was the movie The Guyver as a Md Scientist is mixing animal with Humans and creating weird creatures. Overall had Fun Viewing this one and Again its pretty cheesy. Went to Coney Island on a Mission from GOD … Be back by Five is a coming of age story starring Jon Cryer. Best Friends growing up run in to obstacles later in life in adulthood with one friend in a bad way. Jon Plays one of the guys that wants to look for his old friend who now is homeless and out of his mind. Throughout the film we also see his other friend also has some issues. This is another movie I have never seen and was great seeing Jon in a movie and a Young Jon Cryer at that. The overall look of the film is great and I have to say I Like this one too. Happy to have it on my shelf. With those films coming from MVD’ Rewind Collection I have High hopes for the next releases and I look forward to viewing them. I Say Give them a shot and start collecting. Hit up the older releases and pre-order the new ones. Comeback again for my next round-up of MVD Rewind Collection releases. Thanks to MVD Rewind Collection for the films and I cant wait to see whats next.